Gayle Greeno was born in Glens Falls, New York, in 1949. 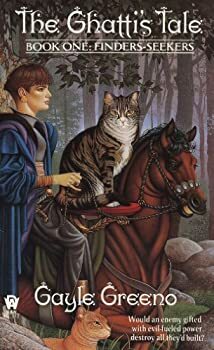 Ghatti’s Tale — (1993-1995) Publisher: The telepathic bonding between pairs of human Seekers and catlike ghattis enables the Seekers Veritas to distinguish truth from falsehood, insuring that justice prevails on the world of Methuen. When a renegade Seeker/ghatti pair begins targeting Seekers for murder, a young woman finds her world’s salvation locked in the recesses of her hidden past. Strong characterization and inventive world building highlight this series opener, making it a good choice for most fantasy collections. Finders Seekersis the first book in Gayle Greeno’s Ghatti’s Tale series. The Ghattis are large telepathic catlike creatures who lifebond with humans. Together, the two serve as a truthseeker team, sifting through the thoughts of people involved in civil and criminal disputes. When someone starts killing the Ghattis and their human companions, the Ghatti Khar and her bondmate Doyce set out to unlock the secret behind the deaths, and attempt to hold the world of Methuen together. Mind Snare — (1997) Publisher: When an assassination attempt threatens to destroy his theater troupe, the last luxury left to Earth’s satellite colonies, fifteen-year-old Glynn resorts to forbidden technology to track down the killers on the mother planet below.